I was playing the very last level before you face Cynder for the final time, where the portal to the Dark Relm is. Usually, I keep the volume down because my sister works all night and I don't want to wake her up. Plus, it's all just jumping and gliding anyways. But today, she had gone out so I cranked it up! Then I noticed a creepy voice whispering "Spyro..." every now and then. I had to double check myself to make sure I wasn't imagining things. Malefor was calling Spyro! O~O I felt like I was really missing something...or am I actually imagining things? *shudders* Ah! xD lol! Maybe he really feels like he's drowning in the dark relm, but he can sense Spyro is nearby, so he calls to him. 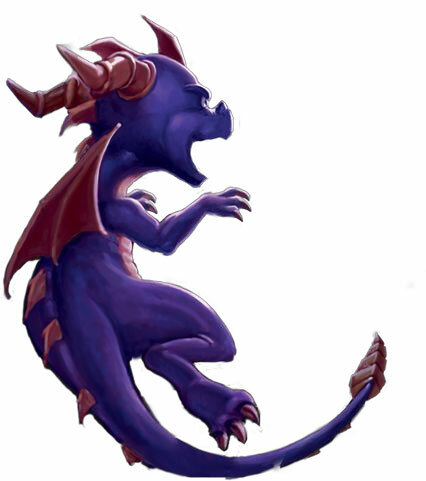 Or maybe he knows Spyro was trying to stop Cynder and just wanted to scare him out? I was just jumping form platform to platform and then I hear Malefor calling his name. I never heard it when jumping from platform to platform, I only remember hearing it in the cutscene afterwards. That's probably cause you didn't wait long enough. Actually, I think it's those weird space aliens making the noise. Whenever I get near one, I hear it. how long do i have to stay to hear it then? Don't know. Just stay until you hear it. Or find a recording on YouTube. Now that I listen... I hear it too. I remember that! They did it again in the intro for TEN. I was replaying ANB, and I noticed it. I was all like "WOW, BAZAAAM!!!". Oh I've heard that, Sooo creepy. I kinda just ignore it though. I actually know at what point he says it and recite it myself in a really old man sounding voice and add something at the end like "Spppyyyrooo...It's sooo boring in heeereeee..."
At first I did not notice but then I did. Yeah, I think I heard that, too. I can't exactly remember if I did or not but I'm sure they would put something in like that. Always when I'm at this level, "Convexity" I hear those voices. The first time, I thought they were ghosts. I thought this was common knowledge. The voices also say "Cynder".